Mitch Sliga pins an opponent. The junior will look to snap a three-match skid this weekend. as the Big Ten Championships approach. The Wildcats (6-7, 1-6 Big Ten) have struggled this season in a strong Big Ten conference. Wrestlers such as Conan Jennings, Mitch Sliga and Jacob Berkowitz have moved in and out of the national rankings throughout the winter. But the team as a whole has had difficulties keeping up with conference powerhouses and let many of its closer contests slip away. Despite the underperforming Terrapins’ (2-12, 0-7) vulnerability, coach Matt Storniolo said he believes in preparing for competition without regard for the opponent. 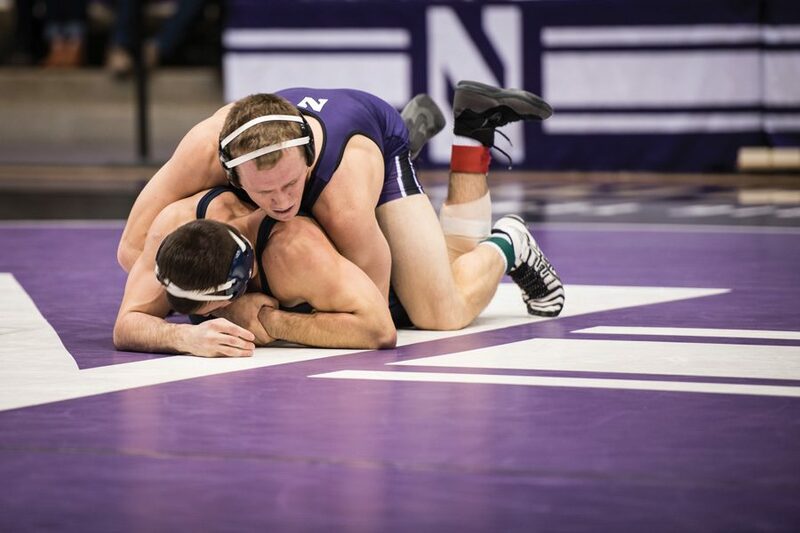 On Sunday, NU will fly out to face another Big Ten foe, Rutgers (11-3, 5-2), in its final dual meet before the postseason. It will be the Cats’ second multi-dual weekend in three weeks. Jennings, the heavyweight sophomore, said he is unfazed by the Scarlet Knights’ No. 13 ranking. Over the weekend, he is likely to spar with Maryland’s Youssif Hemida and Rutgers’ Razohnn Gross, both unranked. Jennings’ confidence is justified. Despite a two-match losing streak, he has held his own with the country’s best. His loss to Penn State’s No. 3 Nick Nevills, which Jennings described as “super annoying,” was decided in the bout’s final seconds. Sliga, the 184-pound sophomore, finds himself in a similar position to Jennings this week. A loss to Illinois’s Emery Parker last weekend was his third straight. But Sliga’s recent competition has been steep; his last three opponents were No. 12 Parker, No. 2 Bo Nickal of Penn State and No. 7 Nate Jackson of Indiana. Also looking to pick up two wins this weekend is 197-pound senior Berkowitz, who wrestled the final home match of his career last Friday on Senior Day. Berkowitz’s pin of Illinois’ Andre Lee, coupled with the celebration that followed, represented one of the few highlights from NU’s 28-15 loss to the Fighting Illini. Berkowitz will carry a 20-7 season record into the weekend, and Storniolo said that the senior is in a great position to conclude his final year wrestling at NU on a high note.